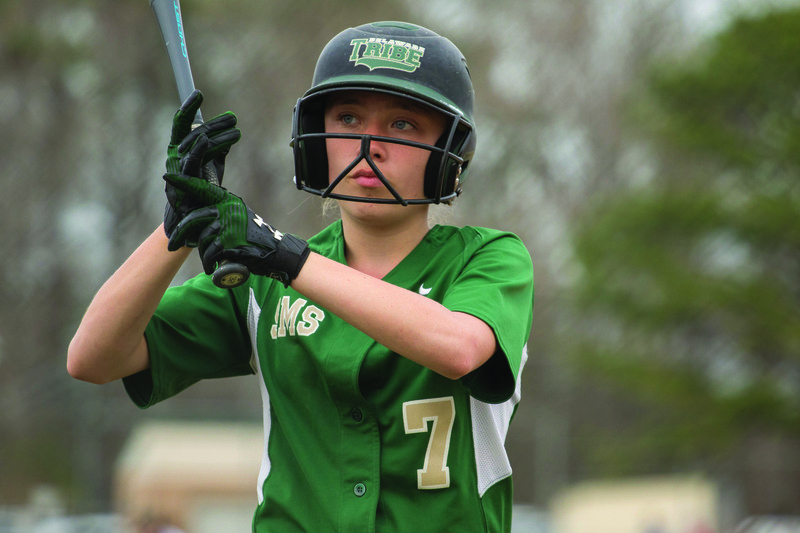 Selbyville Middle’s Lily Hoban prepares for her at bat on Monday, April 8. It has been more than three years since the Selbyville Middle School girls’ soccer team has tasted defeat, and during that time they’ve collected an overall record of 37-0-1, including a 4-0 mark so far in 2019. The wins this year have come against Laurel, Delmar, Seaford and Mariner. While that record is certainly impressive, just check out the scoring difference —181 goals to 10. Yes, 10. This year, the Indians have been led by Sophia Scurci, with 12 goals in the four games — all hat tricks. Her sister Bella Scurci has scored four goals to go with seven assists. Madison Neal has chipped in three goals and four assists. Team captains Carley Topper and Kendall Cathell have combined for five goals and three assists. Others scoring goals for SMS this season include Fani Cruz-Bonilla (2), Addison Jerns (2), and Ava Questschenbach (1), Hanna Taylor (1) and Anahi Parada (1). The Indians were set to host Sussex Academy on Wednesday, April 10, after Coastal Point press time, and will also see Georgetown visit the River Soccer Club complex on Monday, April 15. Laniya Lewis, Jaya Shaub and Lily Hoban led a 12-hit Selbyville attack as the Indians cruised to a 12-2 win over Sussex Academy on Monday, April 8. Lewis and Shaub each went 3-for-4, with Shaub’s three hits all being doubles. Lewis had Selbyville’s biggest hit, which came in the fourth inning, when she smacked an inside-the-park home run. Hoban chipped in a 2-for-3 performance from the leadoff spot, with a triple. Winning pitcher Camryn Ehlers needed just 53 pitches to cover the five-inning complete game. She allowed both runs on just three hits, with four strikeouts and no walks. The win improved Selbyville’s record to 3-1 on the season. They were set to face Georgetown on Wednesday, April 10, after Coastal Point press time. The Indians’ boys’ track team picked up three wins in a quad-meet against Beacon, Mariner and Seaford, hosted at Cape Henlopen High School on Tuesday, April 9. The Indians defeated Beacon, Mariner and Seaford by scores of 63-46, 69-40 and 75-34, respectively. Ashton Stephens won the 100-meter race, while Thomas Gogarty finished first in the 200. Hayden Hall was tops in the triple jump, with Hayden Davis picking up a pair of wins in the shotput and discus. Selbyville’s 4-by-100 and 4-by-200 relay teams were victorious as well. Selbyville’s girls’ track team posted a 2-1 mark in a quad-meet with Beacon, Mariner and Seaford on Tuesday, April 9. The Indians wins came against Seaford (88-21) and Mariner (59-50), while their loss was to Beacon (77-32). Aniya Blake won the 100 and 200, while Saige Dismuke took first place in the high jump for the only event wins for Selbyville.